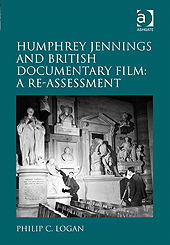 This is the latest in a sizeable body of work focusing on Humphrey Jennings, perhaps the most celebrated of the British Documentary filmmakers, and maker of works of the documentary canon such as Listen to Britain (UK 1942), Fires Were Started (UK 1943), and A Diary for Timothy (UK 1945). Jennings, whose work was sustained during his entire career by government propaganda agencies, was remarkable for his experiments with poetry in film. Philip Logan, a British independent scholar, believes that further attention is necessary because others have pigeon-holed Jennings with “designations such as ‘painter,’ ‘writer,’ ‘surrealist,’ or ‘documentary film maker.’” He sees all these characteristics, and more, woven together by Jennings’ “poetic imagination.” He also believes that earlier writers have focused on a few of his early wartime films as his best, and failed to provide the complex historical and economic context of his productions. Logan provides a meticulous, chronological portrait of Jennings’ career, in which he both draws on existing work and consults primary documents. After an introduction featuring his early life, Jennings’ personal and family life never again intrude. Each of Jennings’ films is described shot by shot, with some interpretive effort. Logan is unfailingly if unassumingly Jennings’ champion, duly noting criticism of his work – particularly the later films – while usually critiquing the critiques for failing to share Jennings’ poetic vision. The book gives the reader a good appreciation for Jennings’ articulation of his artistic challenges, and for the centrality of poetry as a way to understand and communicate about the world. Jennings’ love of music is woven throughout his work, Logan notes. He quotes and demonstrates Jennings’ enthusiasm as an artist for what he learned – it seems to have been a constant revelation – of the way other classes in Britain lived. Logan makes a good case for Jennings’ poetic sensibility being the lens through which he made his work. His careful chronology also allows readers to see connections between different parts of Jennings’ life, and to understand the enormous fertility of the years 1935-38, the only years when he was not working indirectly or directly for the government. His work for companies producing then-bleeding-edge color film put him in constant contact with other artists and encouraged his wildest creativity. The technical and bureaucratic conditions under which Jennings worked form an integral part of the narrative of Jennings’ work. As a poet with a passionate commitment to document the vitality of daily life across the lines of a class-riven society, he flourished in the improvised environment of the early war years and increasingly chafed at the more bureaucratic and hierarchical environment that grew up around government-sponsored filmmaking. Readers who are not familiar with the wider political and social context, though, may find themselves in need of Wikipedia at times. They will not, for instance, get much orientation beyond the London gallery scene about the aesthetic ferment to which Jennings was clearly responding, and which the city symphony form (which he also used) showcased. Jennings was fascinated by how machines were changing relationships between people; in this too he was swimming in a strong artistic current, about which we learn nothing. Jennings’ experiments in “mass observation” (a team of likeminded experimenters attempted to fathom public sentiment and represent it), besides being a fascinating example of crowdsourcing research avant la lettre, participated in a wider and ferociously engaged artistic conversation linking social commentary, artistic practice and political action. His fascination with having the artist represent the society to itself (Logan: “the poet as a messenger who brought the news about the people from the people to the people”, 340) was strikingly Vertovian. They will not get help here in understanding the tenor of the fierce ideological battles informing political life at the time. And if younger and international readers are not already familiar with terms such as “phony war” and “people’s war” they’ll have to look that up too (though maybe they should). Nor will they obtain psychological entry to Jennings’ decision-making. There is very little in this book on Jennings as a personality, or on the emotional experience of the creative process. He appears to have understood the mandates of the government agencies he worked for and negotiated them well with his own concern for a respectful and honest representation of, in particular, working-class cultures. But there is not much on the process by which he worked such things out. His relationship with editor Stewart MacAllister – so intimately a part of the creative process that it is not always clear to scholars today whether a work should primarily be ascribed to Jennings, to MacAllister, or to both equally – is noted without having any texture. There is light discussion of conflict among the Griersonians, and dislike for Jennings’ approach among some of them, but not enough to orient the uninitiated, and how Jennings situated himself within the community is revealed by choices within specific projects about the projects. But then, what Logan promised to do was to trace Jennings’ “life and professional film career in a wider and more immediate historical context.” This career biography indeed provides an extensive and well-documented record of Jennings’ work in an immediate historical context, as well serving as a reference point for the accumulated Jennings-related literature.